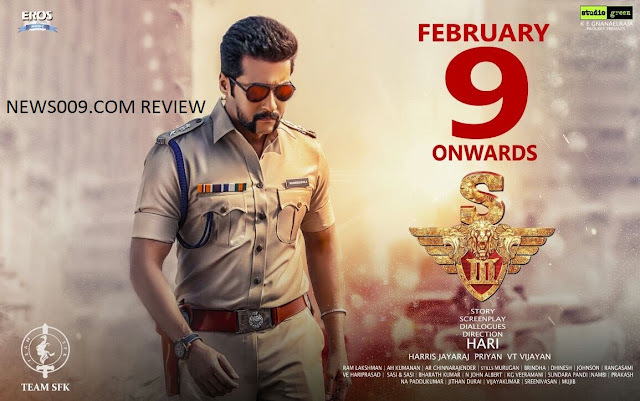 Surya Singam 3, Telugu, Tamil Movie Review. Singam 3 movie released today worldwide after many postpones from november and december. Movie is receiving positive reviews all over for its high action mass elevated and police investigation scenes. 1st and 2nd versions are super hit at box office and 3rd version is very better than other. Movie released in more than 2000+ centers worldwide where morning shows are cancelled in andhra, telangana due to money issues but may start from noon or 1st show. Story - Story is about dynamic police officer who goes to abroad to catch criminals and how he investigates the case is the major elements which shown here. Positives - Action scenes, Camera, BGM, Few songs, 2nd Half, Speedy screenplay. Negatives - 1st Half, Comedy. Verdict - Singam 3 is best of all versions. Movie is for mass audience. Its a watchable movie.